NovaBond ARC – Adhesive Remover & Cleaner is a food grade clear, colourless bio-based oil combined with cleansing alcohol and a mild, slow evaporating solvent, which cleans and protects. It dissolves adhesive, grease, tar & gum removing them cleanly from surfaces leaving a protective film that can be removed with a mild detergent solution if necessary. It also protects against further adhesive bonding / residues and repels moisture. 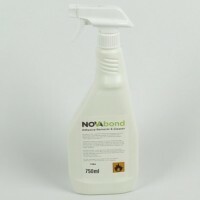 NovaBond ARC is also ideal for cleaning stainless steel surfaces, leaving them clean and with a protective light film of oil. It will clean and protect workshop tools and cutting machinery resisting further adhesive build-up.